A short biography of Grigorii Gorelik, Ukrainian anarchist participant in the Russian Revolution. 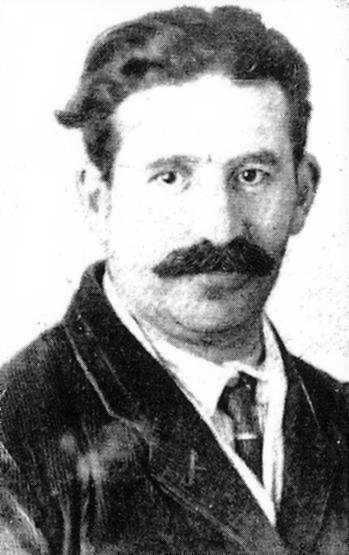 Grigorii Gorelik, usually known as Anatolii Gorelik, was born into a large Jewish family, the poorest in their village, on February 28th 1890. This was at Guenichesk, a little port in the Ukrainian province of Tavrivchesk. He started work at the age of 10 , working selling food.He became an anarchist in 1904, at the age of fourteen. He was active in the Ukraine, and was arrested several times by the Tsarist police in 1909. Later that year he fled to France. He returned secretly to Russia in 1911 then returned to France where he was active in the anarcho-syndicalist movement. In 1913 he emigrated to the USA and was a propagandist with the IWW and the Union of Russian Workers. In 1916 he founded the first Russian syndicalist paper Workers’ Word Rabochaia Mysl’ in New York with Kornuk, which later became Golos Truda (The Voice of Labour). He worked as a teacher. He returned from exile in the United States in 1917, and was active at Ekaterinoslav and in the Donetz basin where he served as secretary of the Donetz Anarchist Bureau. He then joined the Nabat confederation of anarchists and was active in a Nabat group in Melitopol. He wrote later about these experiences: “At Ekaterinoslav, delegates of several hundred villages came to see me, asking me to give them instructions and to understand how to construct the new life; the Commune. Never would I have suspected such a thirst for knowledge and light in the Ukrainian peasantry”. He describes how he undertook correspondence with 1,400 villages as secretary of the anarchist bureau. Equally he describes the extraordinary influence of anarchist ideas amongst the workers of the Donetz basin. He was co-editor with Peter Arshinov of Golos Anarkhista (Anarchist Voice) in Ekaterinoslav in 1918. He continued to work underground under the Austro-German occupation and then counter-revolutionary Denikin’s advance. He was secretary of the Office of Information for Anarchist Propaganda in Hebrew. In 1920 he worked at the commissariat of public instruction in the Ukraine. He was arrested after the breakdown of the treaty between the Bolsheviks and the Makhnovists at Kharkhov with other Nabat members - Voline, Fanya Baron, Mratchny, Olga Taratuta, Yarchuk etc.- and sent off to prison in Moscow in November 1920. He was freed on 6 January 1921 and he continued with anarchist propaganda in Moscow, above all in the universities. He was rounded up on 8 March during the Kronstadt insurrection. He was condemned to 3 years in the concentration camps as an “anarcho-counterrevolutionary”. He was imprisoned up to 17 September and after ten days of hunger strike and the scandal at the Congress of the Red Union International (Profintern) was finally expelled with ten other anarchists. In Berlin in March 1922 he wrote his memoir of the Revolution- The Anarchists in the Russian Revolution, where he details the influence of anarchism among the Russian masses. He fell out with other Nabat members in exile in Berlin and emigrated to Buenos Aires, at the invitation of the FORA, where a new Golos Truda group had been formed in 1919. He also contributed many articles to the Spanish language anarchist paper La Antorcha, explaining in detail on the nature of the Soviet regime. He also polemicised against the influence of syndicalism on the anarchist movement, which he regarded as reformist and negative. When the military coup of 1930 closed down the libertarian press in Argentina, he began writing for the libertarian review La Revista Blanca in Barcelona. In 1940 he suffered an attack of paralysis and remained in this situation for the next 16 years, in difficult and straitened circumstances, cared for only by his companion Fany. He died in a Buenos Aires hospital on 15th November 1956.